The two primary ways a building structure loses energy are via convection (air leaks) and conduction (through solids). Building with Insulspan® Structural Insulated Panels (SIPs) perfectly address each of these issues, resulting in superior energy efficiency. One of the hallmarks of a quality home or commercial building is a tightly-sealed, well-insulated structural shell. Usually, insulation fails because gaps and cavities along the walls or roof allow interior conditioned air to escape while also permitting unconditioned air to infiltrate the structure. 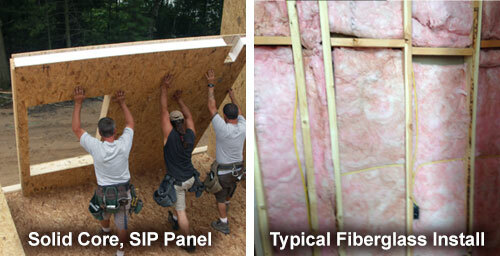 The Insulspan SIP panel system provides a continuous core of solid expanded polystyrene (EPS) insulation. This means it does not sink like fiber batting or shrink over time like spray foam. A recent study by the U.S. Department of Energy found construction using structural insulated panels can reduce air leakage to as low as 0.2 air changes per hour (ACH). This is significantly less than the ACH of stick-framed buildings. When the conditioned air inside your home is prevented from leaking out, you not only save money by re-conditioning that air, you live in more comfortable interior spaces. Not only is our insulation capable of meeting or exceeding the recommended R-values (thermal resistance) for every climate, our whole-wall and roof SIP systems reduce the number of thermal bridges. A thermal bridge occurs every place within a wall where the insulation is interrupted. In a standard home, for example, there are 2″ x 6″ studs located every 16-inches. And, each of these breaks in the main insulation creates an opportunity for energy to easily transfer through the wall because wood offers less resistance than insulation. 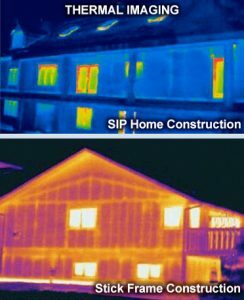 Insulspan EPS SIP walls and roofs have far fewer thermal breaks. The result is a higher R-value for the whole-wall as compared to a stick-framed wall. Insulspan SIP panels are available in a variety of widths in both our standard and R-plus Neopor® EPS products. Choose the R-value that best meets the needs of your building location and energy-efficient goals. Are you interested in learning more about the Insulspan SIP system that offers superior energy savings as well as other construction values?